It is finally September. Many of us have been nervously watching to see if there is any signs to the quality of the upcoming salmon run is going to be. What I can tell you is we have been seeing small groups of salmon trickling through the DSR on a daily basis. 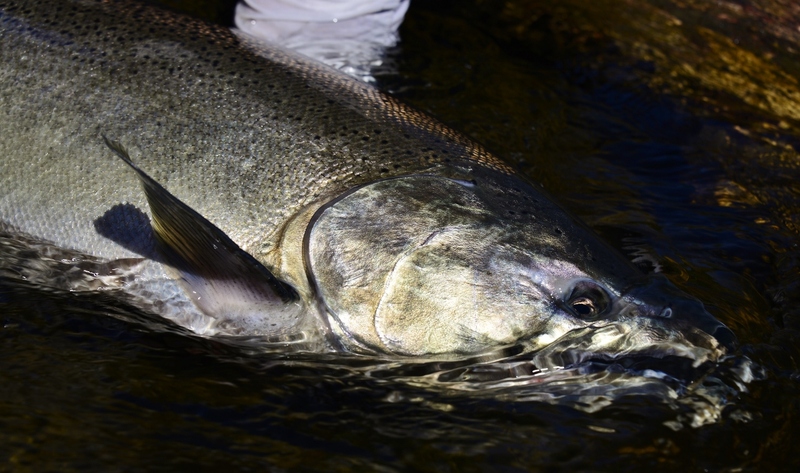 To have a few salmon moving into the river the last week of August is a strong positive sign. Starting this month the minimum water flows are now going to be 335 CFS, I suspect the day the water goes up there will be a tiny search of fish, but that will be it. The weather for this coming week is supposed to be hot. Water temperatures are going to rise into the low 70° mark, and the cold water in the Lake is going to push way offshore. This will for all practical purposes put a stop to the fish that are ready to move into the river, temporarily. However the long-term whether forecast for early next week looks very promising. It is still early but there seems to be some salmon are eager to run, all they need is just a little encouragement. Keep in mind we are now fishing the tributaries, conditions can and do change quick. The trout fishing has not changed much over the past week. At this point some trout streams are making the transition into their fall fishing pattern. Fish are starting to feed the larger food sources such as crayfish. While others are still having there late summer hatches. Tricos are still going all up and down the Oatka creek. This is a size 20 mayfly; the timing of the hatch is in the morning. You will want to be on the water around 7 AM, Depending on air temperatures that day the hatch will around up sometime between mid to late morning. The rivers that have an Isonychia hatch are now going on. This hitch trickles off throughout the day. You do not always see a lot of bugs around but, the fish are looking for the bugs. There is still space available for the spey casting clinic.